The discovery of a fundamental, previously unknown property of microbial nanowires in the bacterium Geobacter sulfurreducens that allows electron transport across long distances could revolutionize nanotechnology and bioelectronics, says a team of physicists and microbiologists at the University of Massachusetts Amherst. Their findings reported in the Aug. 7 advance online issue of Nature Nanotechnology may one day lead to cheaper, nontoxic nanomaterials for biosensors and solid state electronics that interface with biological systems. The researchers report that this is the first time metallic-like conduction of electrical charge along a protein filament has been observed. It was previously thought that such conduction would require a mechanism involving a series of other proteins known as cytochromes, with electrons making short hops from cytochrome to cytochrome. By contrast, the UMass Amherst team has demonstrated long-range conduction in the absence of cytochromes. The Geobacter filaments function like a true wire. 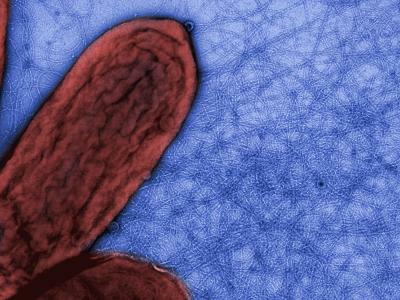 In nature, Geobacter use their microbial nanowires to transfer electrons onto iron oxides, natural rust-like minerals in soil, that for Geobacter serve the same function as oxygen does for humans. “What Geobacter can do with its nanowires is akin to breathing through a snorkel that’s 10 kilometers long,” says Malvankar. The UMass Amherst group had proposed in a 2005 paper in Nature that Geobacter’s nanowires might represent a fundamental new property in biology, but they didn’t have a mechanism, so were met with considerable skepticism. To continue experimenting, Lovley and colleagues took advantage of the fact that in the laboratory Geobacter will grow on electrodes, which replace the iron oxides. On electrodes, the bacteria produce thick, electrically conductive biofilms. In a series of studies with genetically modified strains, the researchers found the metallic-like conductivity in the biofilm could be attributed to a network of nanowires spreading throughout the biofilm. These special structures are tunable in a way not seen before, the UMass Amherst researchers found. Tuominen points out that it’s well known in the nanotechnology community that artificial nanowire properties can be changed by altering their surroundings. Geobacter’s natural approach is unique in allowing scientists to manipulate conducting properties by simply changing the temperature or regulating gene expression to create a new strain, for example. Malvankar adds that by introducing a third electrode, a biofilm can act like a biological transistor, able to be switched on or off by applying a voltage. Finally, this is a story about cross-disciplinary collaboration, which is much harder to accomplish than it sounds, Lovley says. “We were very lucky to have flexible funding from the Office of Naval Research, the Department of Energy and the National Science Foundation that allowed us to follow some hunches. Also, it took a physics doctoral student brave enough to come over to microbiology to work with something wet and slimy.” That student, Nikhil Malvankar, now is a postdoctoral researcher who with Lovley and Tuominen will continue exploring what gives Geobacter’s protein filaments their unique electrical properties.